Disclaimer: At PAX East this weekend I attended a social hosted by Motiga on Saturday night that included free drinks and refreshments. At the social I won a Proteus Core in a free raffle (everyone who entered received a ticket). My press demo of the game was Saturday afternoon. The first and only thought I had before playing Gigantic this past weekend is “their booth is where?” Motiga, the indie studio behind the upcoming MoBA-like game, Gigantic. After the match I played, I can tell you I am 100% sold on the game, and I believe Motiga absolutely has a gem on their hands. 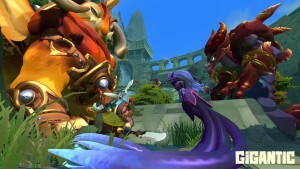 Gigantic, at first approach seems like an idea very similar to SMITE. It’s a 3rd-person over-the-shoulder push style game reminiscent of standard MOBAs. That, however, is where Gigantic steps away from convention and decides to distinguish itself. 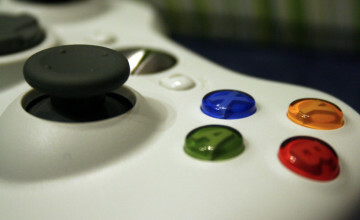 The game takes into account different play styles. Some characters are better for twitch shooters, other characters are better for planners or people who prefer more strategic movements and placements. Still others are better for people who prefer to just rush in and play hack’n’slash style games. The map is only one “lane” and there are no creep waves like standard MOBA games. There are, instead, six objectives for players to capture. Capturing the objective felt, to me, reminiscent of a few FPS titles like Battlefield or Call of Duty. To capture the objective you summoned a creature that acted as a guardian. There are three possible summoned creatures with different abilities like healing (usually used as the frontline creature) or revealing hidden enemies, etc. Holding the objective points filled the meter that corresponded to your guardian. 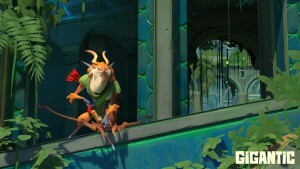 Guardians are the final objective in Gigantic. You have your own guardian you are trying to defend while attacking the other team’s guardian. You can’t just run up and attack a guardian, however. You have to wait until your team’s guardian advances (when the previously mentioned meter is full via the steady build up from objectives or kills) and knocks down the other team’s guardian, revealing the weak spot in its center. That’s when you attack and try to take out as much health from the opposing guardian. You win when you completely get rid of the health of the other team’s guardian, but you can’t just chunk out all the health at once. 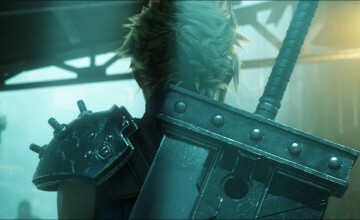 There are three segments to the guardian health bar and you can at most eliminate one segment at a time. Teamwork was absolutely important when I was playing. We had to make sure our team fit cohesively and that we were acting together whenever possible. 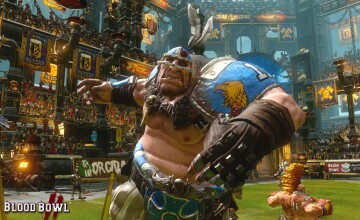 The variety of heroes absolutely helped, and for an alpha game they already had an impressive cast of characters including HK-206 (a DPS character that has many forward-facing ranged cone attacks including a gatling-gun style attack), Tyto the Swift (a fast-moving assassin), and Margrave (a melee tank). I, myself, was able to play the character Voden. I absolutely think Motiga has a gem on their hands with Gigantic. Voden was a fox archer who could charge up his auto attacks, drop a poison cloud to shoot through that gave his arrows poison damage, he could make a clone/decoy that also fired to deal damage, and he could drop a healing aura to help in battle. That healing aura also served as an escape by giving Voden a one-time super high jump. For Voden’s ‘ultimate,’ he could fire an area-of-effect root that would temporarily hold enemy teammates in place if it properly hit someone. Voden’s totally gonna be my main. Playing Voden felt a lot like playing an intense arena shooter. His mechanics made him a fantastic hit-and-run support shooter who could deal pretty good damage-per-second from a distance then run in, drop his heal to support the melee team before bouncing away to find a vantage point and deal more damage. His shot-charging mechanic felt natural and fluid, as did his poison mechanic. Leveling up in the game is a little different than other MOBAs. Instead of a strict progression, you can put ‘ability points’ towards advancing a tree on each skill. Leveling a skill up isn’t just a simple “I want my Q to advance,” but rather it’s an actual thought of asking how you want the skill to advance. I thought that was an interesting idea. Speaking of leveling up a “Q” ability, the skills are mapped differently than I expected. Instead of SMITE‘s 1-4 system, Motiga uses a much more (in my opinion) ergonomic approach of mapping skills to Q,E,F, and the right mouse button. F is the “ultimate” ability while right click is most likely the button you press most often on each character (for some it’s aiming, while for Voden it was dropping his poison cloud). This mapping felt incredibly fluid to this style of game, and I definitely think Motiga is onto something. One incredibly pleasant surprise I found in the game was how much turnaround play was possible. The “chunk of health” mechanic for the guardian’s health allowed teams to come from behind against incredible odds. In the game I played, our team’s guardian had lost 2 bards of health while the other team’s was practically untouched. Despite this, we still managed to pull together and won the match in a complete upset. 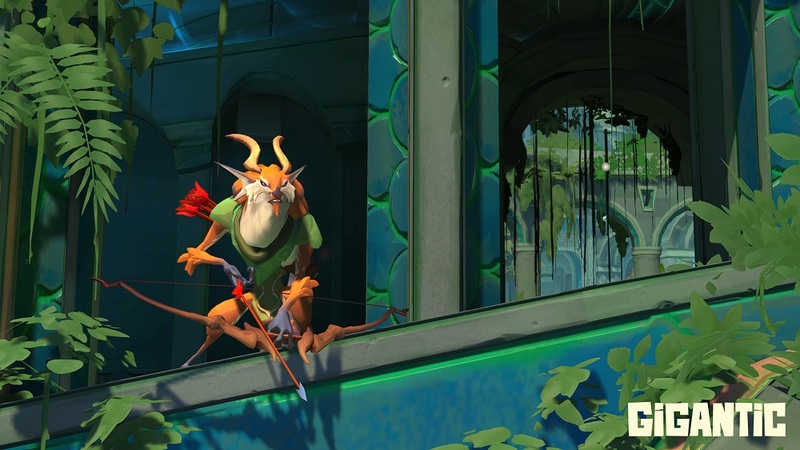 I was able to speak to the VP of Product Development at Motiga, James Phinney, and he confirmed this was something the developers thought a lot about when designing the game. They don’t want snowball champs or snowball games, but instead they aimed for every game to feel exciting and for teams to feel like they could always come back. Something else I fell in love with on the game was its art style. 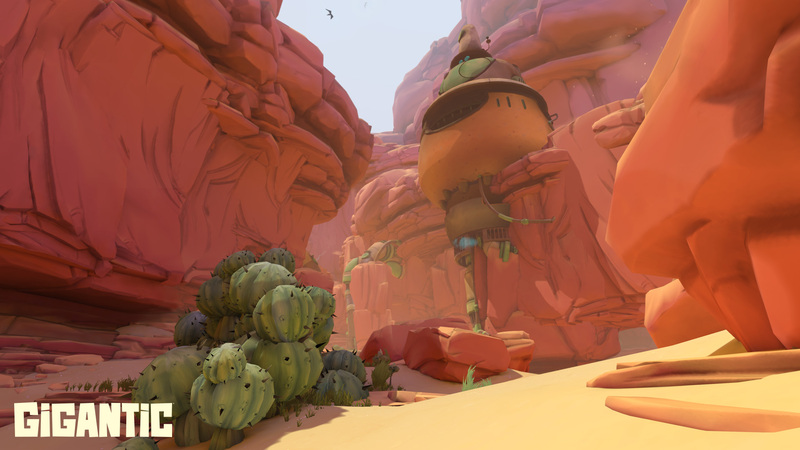 Gigantic is almost-but-not-quite CEL shaded and highly stylized. I couldn’t quite place exactly why it felt somewhat familiar, but as I was talking about the game to someone else, they mentioned The Legend of Zelda: Windwaker, and it all fell into place for me. Gigantic‘s art style reminded me a lot of Windwaker, just perhaps with a slightly more adult theme to it. I was very happy with the art of the game. Something else I really appreciated was Motiga’s apparent community-driven approach to development. They’re an indie developer who brought in a very good, and very active closed alpha crowd. They even invited some of their most active members to come to PAX East and act as “community coaches” who spoke with the press and helped us get our bearings in the game to begin with. One community coach was even flown in from Germany. Every single person I spoke to was talking about how great the Gigantic community is already, and how excited they were to be helping out. At the social I attended Saturday night, there was even an impromptu community vs. developer tournament. The developers lost. The tournament was also shoutcasted by several members of the community who took to the mics and relayed their enthusiasm about the games. The final match in the tournament was barely one, as each team’s guardian only had a sliver of life left. It was probably one of the most exciting matches I saw during the day. 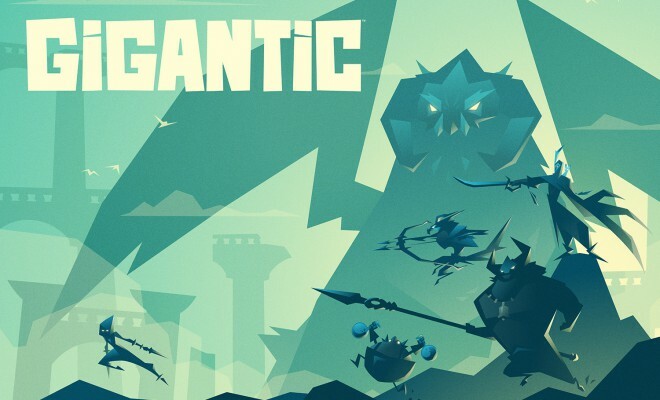 Gigantic recently announced a huge partnership with Microsoft. The game will now be a Windows 10 and Xbox One exclusive. I pressed to find out whether or not the game would be playable on Windows 7 or even 8.1, but all I heard back was “We are actively developing for Windows 10.” All things considered, it’s not the worst since Microsoft will offer free upgrades to their new OS once it’s formally released, but I am sure there will be many PC gamers disappointed by that news. One cool feature that comes from the partnership is the ability for crossplay: PC Gamers and Xbox One gamers will be able to play in the same matches, though not in ranked modes. It’s an opt-in feature where everyone involved will have to actively enter crossplay games. Motiga understand there’s a huge difference between game design for console and PC and what the peripherals allow, so they don’t want any one platform to get a ranking advantage by beating up on the other. It should, however, be fun to play against or with friends who have one platform and not the other. All in all, I absolutely think Motiga has a gem on their hands with Gigantic. I haven’t felt this excited about a game in a while, and I think it’ll go far. Right now the game is in closed alpha, and there is no word on when it or the beta will be officially released except for “2015.” You can sign up for the game at their website if you are at all interested. I know I am excited about the game, and I am absolutely trying to get into the community/game as fast as possible.